Bro-coun­try may still be a slick, pree­m­in­ent sub-genre with­in coun­try mu­sic’s rur­al firm­a­ment and tanned, brawny dudes such as Kenny Ches­ney pack sta­di­ums with their gen­tle­manly jive. 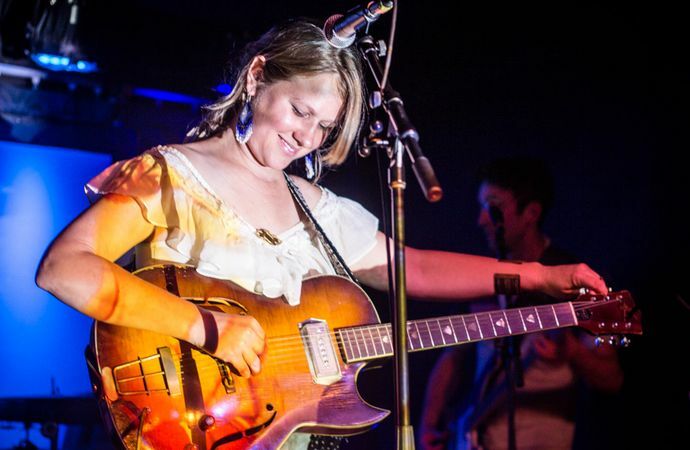 Yet, in the middle of June—on the same week Dolly Par­ton sold out the Mann and Dixie Chicks, the BB&T Pa­vil­ion—South Philly’s once-and-former bas­tion of bar­room C&W, Boot & Saddle, hos­ted a re­cord re­lease party for bit­ter­sweet Emily “Bird­ie” Busch. The long­time Philly-folk-coun­try queen, who re­leased her first re­cord in 2006 (The Ways We Try), stood on the crammed tight stage de­b­ut­ing her sixth al­bum—the psy­che­del­ic-tinged Thun­der Bridge—with her el­eg­ant nu­anced voice and her strangely subtle av­ant-hill­billy band be­side her. “I love how ec­cent­ric coun­try mu­sic got in the 1960s with Lee Hazle­wood, Ro­ger Miller, Hazel Atkins,” says Busch. She quickly adds Ger­man­town jazz man Sun Ra to that list, if only for the “emo­tion­al in­flu­ence,” po­et­ic in­spir­a­tion (the title Thun­der Bridge is a ref­er­ence to a line in his poem “We Must Not say No to Ourselves”) and over­all will­ing­ness to free one’s mind so that her boots will fol­low. Busch is not alone as a loc­al cow­girl with-or-without the blues. At Bob & Bar­bara’s twice-monthly Wed­nes­days, sing­ers Han­nah Taylor and Sarah Larsen rule the roost, Larsen in par­tic­u­lar be­ing a sub-genre of her own; a fid­dler and a vo­cal­ist with the hootenanny-ing Hur­ricane Hoss and her folksy trio Lady­bird both ready­ing new al­bums for au­tumn re­lease. 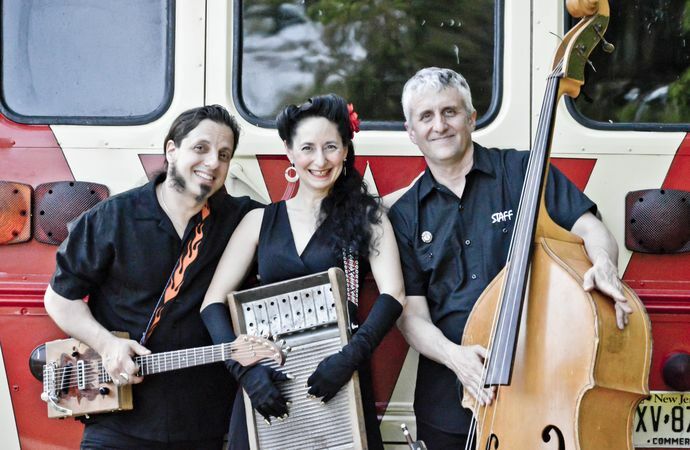 April Mae Iorio is a sassy, South Jer­sey lass with sev­er­al wild acts un­der her wide belt, the bold­est of which—April Mae & The June Bugs—is a hot mess of hill­billy bal­ladry, coun­try swing, jump blues and hard-nosed rocka­billy (plus, her Sun Kissed al­bum came out in June). Car­oline Leap too is a loc­al lass with a west­ern swing sting. Black Horse Motel is a long-run­ning dark coun­try quin­tet with three wo­men and an al­bum due out soon. 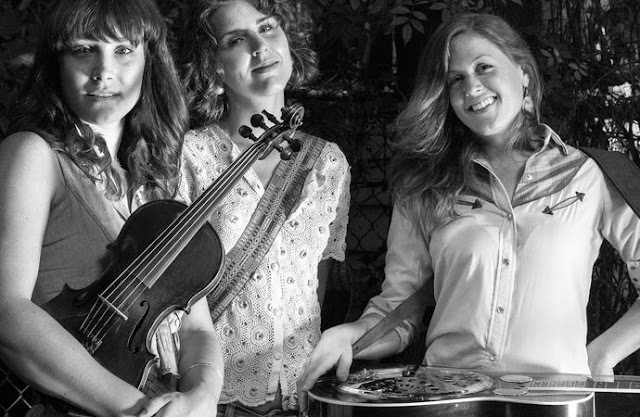 Then there’s the ob­vi­ous folk-coun­try in­flu­ence on Philly al­tern­at­ive names such as the girl-fron­ted Hop Along and Cayetana whose twang is as strong and windy as their tang. Even Philly’s most prom­in­ent C&W ra­dio sta­tion, WXTU FM, has a Philly coun­try lily, An­die Sum­mers, as its morn­ing show co-host. Maybe queen pins is a bet­ter term. While Busch moved around Philly (South and West Philly, now Ger­man­town) and Mae from N.J. to New Or­leans and back again, Sarah Larsen was a Wis­con­sin-born, small town clas­sic­al vi­ol­in­ist who made her way to Philly six years ago by way of Con­necti­c­ut and with-but-a-hint of dis­con­tent. “Noth­ing was harder—or more coun­try—than get­ting out here, find­ing there are no jobs AND hurt­ing my­self in an ac­ci­dent where I wasn’t sure if I’d ever be able to ro­tate my arms again,” says the high, honey-voiced Larsen. She walked dogs and waited tables un­til an­swer­ing an ad on Craigslist look­ing for a fiddle play­er for old time band gigs, an event that led to oth­er op­por­tun­it­ies in loc­al bluegrass ses­sions (e.g., re­cord­ing ses­sions for al­bums by Ben Arnold and Ma­son Port­er). It was bluegrass that pushed Larsen to con­sider her coun­try past, of the one ra­dio sta­tion in Wis­con­sin that was noth­ing but old time hill­billy mu­sic, of an uncle that gave her a Patsy Cline 8-track when she age 9. “That was the coolest thing I ever heard,” she says, quietly. Larsen set about cre­at­ing the sweet-as-pie Philly county lady trio Lady­bird with Cecil­ia Ferne­borg and Laura Szk­larski, be­fore hit­ting upon the catty, cool, au­then­t­ic-sound­ing ped­al steel-in­fused Hur­ricane Hoss, her smash­ing solo pro­ject which sounds Straight Outta Nashville. Larsen tells a cute story about one of her teach­ing gigs, where a bunch of little girls came up to her after the les­son, a tale that lends some in­sight in­to be­ing a young wo­man in an old man’s world.